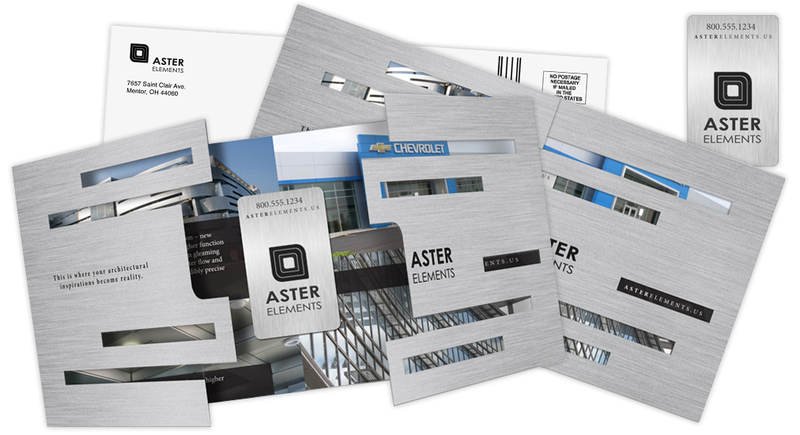 Inspired by the unique facade of their University Hospitals parking garage design, this Aster Elements brochure was precisely planned, die-cut, and finished with a metal texture, allowing the brochure to display what the company does using mostly visuals and minimal text. In the open slits of the front cover, additional project photos from Aster's portfolio can be partially seen before even opening the piece. A version of the brochure featured a metal business card glued to the inside, allowing the front panels to fit perfectly around the logo mark on the card. With the card removed, the Aster Elements logo simply centered in the die-cut window.